Long-billed, trunk probing woodpecker. Common in mature woodlands across much of North America, as well as suburbs and parks. Medium-sized, black and white checkered with white black, black and white wings, and black striped head; males show red on back of head. 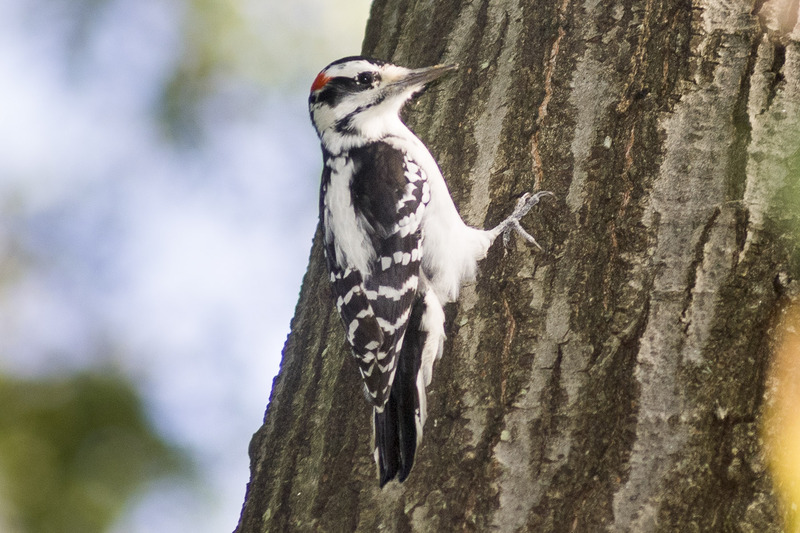 Very similar to Downy Woodpecker but larger, with longer bill, and never feeds on reeds or slender branches. Eats mostly insects with some fruits and seeds; often at feeders for suet and sunflower seeds. Excavates nest holes in dead parts of trees or dead trees. Lifespan up to 15 years. Population ~ 9 million and declining.